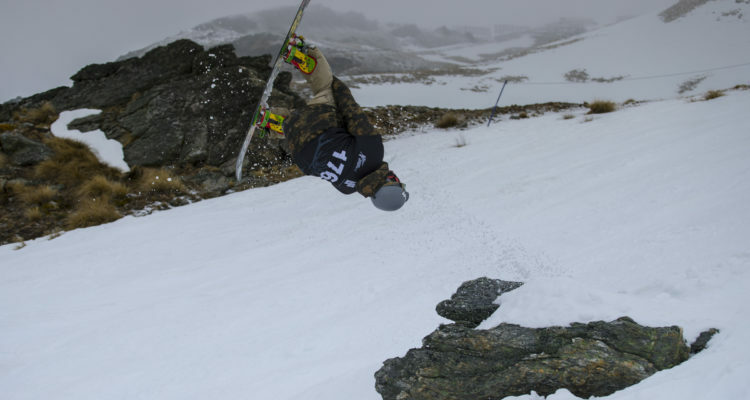 Competitors in the 2016 Cardrona NZ Junior Freeski & Snowboard Nationals were met with murky conditions for day three of competition at Cardrona Alpine Resort near Wanaka today. Overnight rain left the halfpipe saturated and unsafe to run the Salomon Ski Halfpipe event; however, the K2 Snowboard Freeride was able to go ahead with a skiff of fresh snow on course on the Tulips run in Captain’s Basin. With conditions firm and bumpy under a couple of centimetres of fresh snow, judges were looking for safe runs which were well controlled and fluid from top to bottom, demonstrating good riding technique. Competition started with female snowboarders and first rider on course, Eliana Collins (Arrowtown) set the bar high with a technical run, incorporating several rotations and good control for the win in female primary year 5-6. Maddison Butcher (Auckland) one of eight Ruapehu Snow Sports athletes who have travelled south to compete at Junior Nationals, topped off an “incredible” few days by finishing in second place in the female Secondary 11-13 years’ age group. After only a “couple of weeks on snow” when she was younger Maddison joined the RSS programme this season and jumped at the opportunity to compete for the first time. She showed no sign of first-time nerves, speeding through the course, dropping two rocks, ollying over tussock and maintaining control top to bottom. Zoi Sadowski Synnott (Wanaka) was the category winner with Juliette Perera (Auckland) in third. The Primary 5-6 boys ripped through the course looking for features to hit in order to up their scores. Campbell Melville Ives, already a season Junior Nationals competitor at only 10 years old, figured that the judges would be looking for a “fast and flowing” run and knew just how to deliver. Coming out of the start gate fast but quickly adjusting to the catchy snow conditions, he “chilled out” and lined up three jumps, including some stylish grabs and was “pretty happy” with his performance. The judges were more than impressed, wowed by his big rock drop at the top of the course and pleased to see him having fun while maintaining total control. They awarded Campbell first place, with Zephyr Lovelock (Wanaka) second and Jack Jeffs (Hawea) third. The male secondary 7-8 category had the judges deliberating hard over how to award the top four placings. Timo Fitzpatrick (Queenstown) took the top spot, Xandah Gibson (Queenstown) second, and Sunny Steele (Australia) third. Harry Hart (Australia) just missed out on a podium finish by 0.33. North Island competitors had a strong showing in the boys’ secondary 9-10 group, all three medal winners hailing from Auckland. Noah Wotton wowed the judges with a wildcat (side on backflip) right at the start of his run, followed up with a big method air. Coming through the bottom of the course fast, fluid and in total control, the win was his. Oliver Whiley placed second and Mac Rogers third. Following in his younger sister’s footsteps, Tiarn Collins took the win in the 11-13 secondary year age group. His second run had the full package: Fluid, fast and technical, with grabs and rotations and a big smile on the face. Second place went to Ethan Cruise (Queenstown) and third to Ryusei Wakushima (Queenstown). 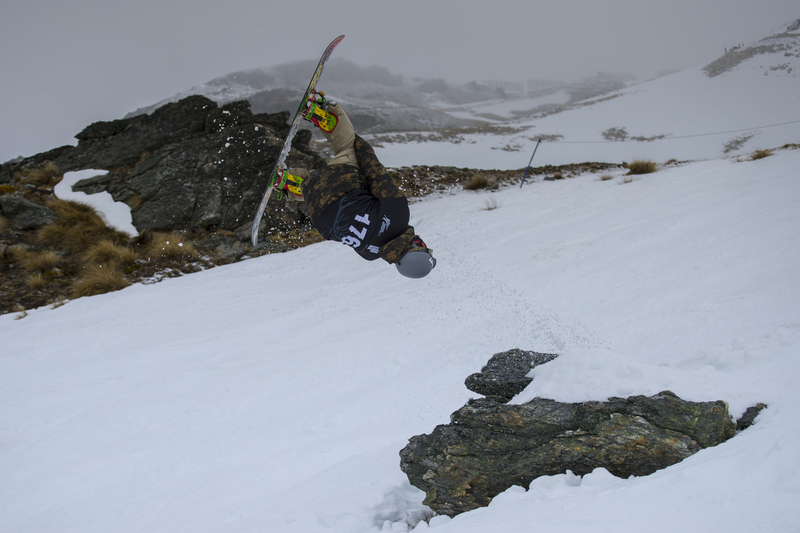 Competition continues tomorrow at Cardrona Alpine Resort with the Bonfire Snowboard Halfpipe and K2 Ski Freeride. The Salomon Ski Halfpipe has been postponed until later in the week, and may run first thing on Friday morning. A new schedule will be released tomorrow.